Strike was adopted from us when he was a puppy and we have no idea why he is at the refuge again, as we cannot get in touch with his owners. And by the looks of things they are not looking for their dog either. Strike needs a new home. Were it not for the fact that he looks like many of the other ScPA dog (that shepherd mix that is so common)he would be adopted very quickly. Because Strike is an extremely well behaved dog. He sits quietly in his cage when a walk is on the cards, and he gets on perfectly with everyone he meets. Let’s hope he hasn’t got too long to wait for a new home. He has just turned 7, so if you are looking for a calmer, steady older dog, he could be your boy! Zebuline’s owner is well known to the SCPA, as we have played host to many of his dogs over the years. Usually he reclaims them, and usually (like always!) we wish he wouldn’t. Zebuline has a chance for a new life, as he has not come to collect her. 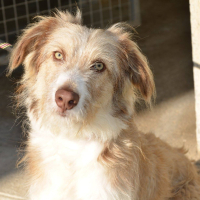 It would be great for this stunning cross breed to find a new home. Zebuline was born in December 2017, doubtless the puppy of one of her owners other dogs. 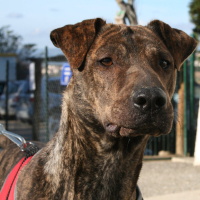 She is really beautiful with staffy-like brindle colouring, but there is nothing staffy about her at all. She is sociable and affectionate. Had she not arrived at the ScPA she would doubtless have spent her life having litter after litter of pups who would have been condemned to the same life. So this is a super save all round. Many of you will probably think that Loubi has been rehomed, because that was the title of one of last week’s blogs. However it did not work out and 24 hours later Loubi was back at the refuge. I did not mention this in the blog because it was absolutely nothing to do with the dog, and the reasons for his return are extremely painful for the family involved. There is no need to add to their woes. They were even more upset because Loubi was absolutely perfect during the brief time he spent with them. He appeared to be housetrained, and despite our warnings about his interaction with their cats, apparently he was absolutely fine with their two felines. So Loubi is looking for a new home. And as he waited so long to find his first home, we really want this to be soon. Loubi was born in May 2018, so he is really still a puppy. He is fine with other dogs, and cats (we now know) and children. He is a lab/griffon cross who has everything going for him, apart from his colouring…yes, you guessed it, Loubi is black. 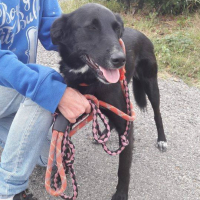 But lots of us like black dogs, of course, so let’s get Loubi out of the refuge and into a home. Loubi is all ready to go, castrated, identified and fully vaccinated. He is waiting for his family at the SPA Carcassonne. He is a pup still, and although he is sharing his kennel with another young dog, he would love a home of his own. Pia is a lovely little girl who has had a difficult time so far and is looking for a new home. Unlike the family’s other dog, who had a normal life, with regular walks etc, Pia was kept inside to look fierce and guard the property. Probably because she is small and stocky and looks like a dangerous dog! It is true that Pia has problems with some men, particularly when she first meets them. She is fine with all the male SCPA employees, however, proving that it is just a question of confidence. On the positive side, Pia is fine with other dogs, and she passed the cat test with flying colours. 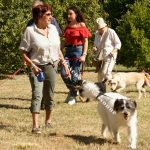 This is a chance to get a staffie type dog with none of the administrative hassle that comes with these breeds here in France. Pia was born in August 2015. 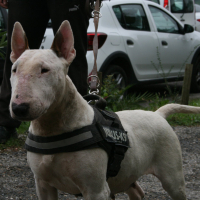 Ilona is a fabulous white coloured bull terrier who needs a new home fairly urgently. We do not know all the details, but we believe that she has been used for breeding. 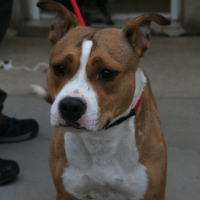 Coming to the ScPA is really a blessing for her, especially as her owners have made no attempt to find her. What she needs now is a new home. 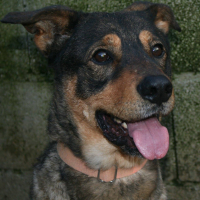 Ilona is wonderful with people, but is a bit reactive to dogs, and she hates cats. 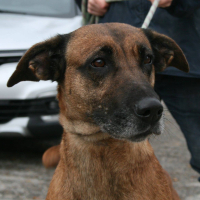 So a home as a single dog would be ideal for this lovely girl who was born in May 2013. What a stunning lad! Edge arrived as yet another non-identified stray in mid October, and almost immediately was sharing his box with a less confident dog. Edge was born in October 2017, so is a very young lad. He appears to be a griffon cross, but with his stunning colouring (just look at those eyes! ), you could be forgiven for believing him to be at least part Australian shepherd. For his lucky owner, a DNA test will soon reveal all. Edge is a great all rounder and is waiting for you at the SPA Carcassonne. Nuts is a very lively and active young girl who is some kind of border collie / shepherd cross. She was brought in by her family who said they no longer had enough time to devote to their dog. Bearing in mind Nuts is only just over a year old, it seems obvious that this is yet another family who should not have got a dog in the first place. She is a lovely young girl, though, very sociable with both humans and dogs, and we are assured that she is great with children. She will be very easy to train, I am sure, and is looking for an active family who is willing to put in some effort to her education. With a relatively small amount of effort Nuts will be a great family dog.